The Red Sox completed a sweep of the hapless Blue Jays 7-0. Paul Byrd looked very sharp against Roy Halladay, who is struggling. Sox have Monday off before traveling to Tampa. 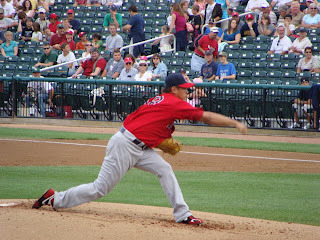 Dice-K had a rehab start in New Hampshire, and it wasn't pretty. You can see the photos and hear the post-game audio right here. Patriots LB Tedy Bruschi will be announcing his retirement today at a 10:45 AM news conference. Glad to see him leaving on his own and not being cut. Apparently he made the decision without any prompting from the team. Ian Rapaport has 5 things we learned from Friday night's game against the Redskins (including the end of the Kevin O'Connell era). UMaine women's soccer fell to Weber St.